This recipe from Hungry Girl is super healthy, ready in 20 minutes, and tastes like pizza! This recipe makes six stuffed mushrooms. The nutritional information is for the entire recipe (excluding optional seasoning). So you can eat all six yourself! 1. Preheat oven to 190°C. Spray a baking sheet with non-stick spray. 2. Place the mushroom caps on the sheet, with rounded sides down. Bake until tender, around 8-10 minutes. 3. Meanwhile, in a small bowl, generously season the crushed tomatoes. 4. Finely chop half of the mushroom stems, and stir into the bowl with the tomatoes. 5. Blot away excess moisture from the bakes mushroom caps. 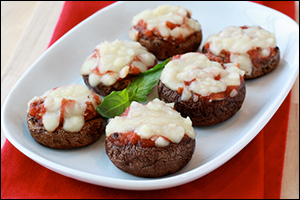 Distribute the sauce mixture among the mushroom caps, and sprinkle with finely chopped cheese. 6. Return to the oven and bake until the sauce is hot and the cheese has melted – around 3 minutes.